On Friday, a federal judge stayed the deportation of New York City immigrant rights leader Ravi Ragbir, after he filed a free speech lawsuit arguing immigration officials unconstitutionally used their power to suppress political dissent by targeting outspoken activists for surveillance and deportation. On Friday, a federal judge stayed the deportation of New York City immigrant rights leader Ravi Ragbir, after he filed a free speech lawsuit arguing immigration officials unconstitutionally used their power to suppress political dissent by targeting outspoken activists for surveillance and deportation. The judge stayed the deportation only one day before Ravi Ragbir was scheduled to be deported. He has now been ordered to check in with Immigration and Customs Enforcement on March 15. 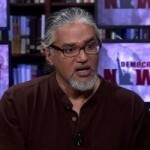 A federal judge temporarily stayed the deportation order for New Sanctuary Coalition executive director Ravi Ragbir on Friday, only one day before he was scheduled to be deported. He’s one of a growing number of immigrants whose scheduled deportations—both individual or en masse—have been halted by federal judges in New Jersey, Massachusetts, Michigan and Florida. On Sunday, in Lahore, Pakistan, the world-renowned Pakistani human rights lawyer and activist Asma Jahangir died suddenly at the age of 66. For decades, Jahangir has been a leading advocate for women, minorities and democracy in Pakistan. In 1983, she was imprisoned for her work with the Movement to Restore Democracy during the military rule of General Zia ul-Haq. Later, in 2007, she was put under house arrest for helping lead a lawyers’ protest movement that helped oust military leader Pervez Musharraf. As one of Pakistan’s most powerful lawyers, she founded the country’s first legal aid center in 1986, served as the first female president of the Supreme Court Bar Association of Pakistan and was the U.N. special rapporteur for human rights, extrajudicial killings and religious freedoms. Democracy Now! interviewed Asma Jahangir in 2007 and 2016. Click here to watch Asma Jahangir’s full speech when she accepted the Right Livelihood Award in 2014.